Coming up with your own outdoor room design is a fun, exciting process that requires you to think about everything from space availability to furniture and decorations. But one of the first things you should consider is the type of shade solution you will use to create this additional living area, whether it’s an outdoor living room or a more casual gathering space. From pergolas and pavilions to gazebos to retractable awnings, there are plenty of options for outdoor or patio room creations–each with pros and cons to weigh. A pergola is a gorgeous option that allows sunlight to shine through parallel, intersecting rafters and headers, which are typically made of wood or vinyl. Supported by four columns or posts, these structures have either a flat or arched top. They are available at department stores for as little as a couple of hundred dollars, but usually this price point indicates a structure that is on the smaller side and made of steel and/or fiberglass. Pergolas that are sleeved in vinyl or constructed of quality wood range from about $2,500 for an 8′ x 8′ to more than $10,000 for very large sizes. Details that can make your pergola design even more special include decorative scallops and end caps, post covers, stone columns and privacy walls, in addition to elegant and rich wood stains. Pergola canopy shades are a great accessory, as they provide additional coverage for parts of the day when the sun is particularly strong. Shop around and you will find a variety of patterns and solids to choose from. 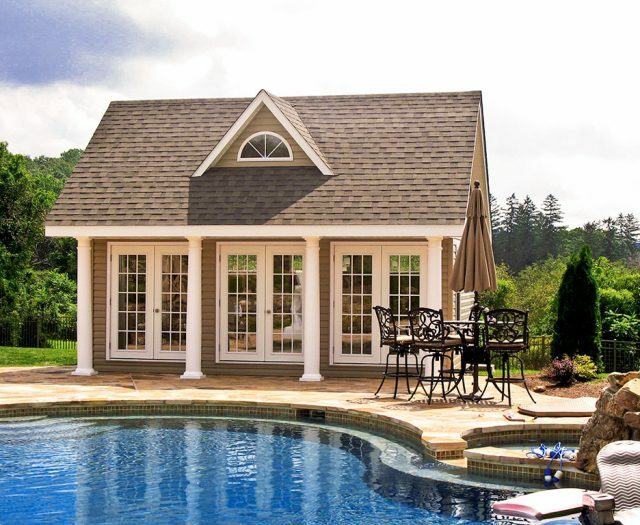 If you are looking for more shade in your outdoor living area, a pavilion may be the right choice. Like a pergola, pavilions have no walls and are supported by columns. But unlike its sister structure (the pavilion), the pergola has a roof that is solid, so there is greater protection from the sun. Typically, pavilions are rectangular with pitched hip-style roofs. Less common shapes include hexagon and oval. For top quality material, look for mainly wood and/or vinyl; a metal or shingled roof; and brackets at the base of the structure for attachment to a deck or a concrete foundation. Pavilion options and accessories range from post skirts and column bases to ceiling fans and stains to cedar or composite floors. Cupolas are popular, too, and can add to the elegance of the structure. Pavilions typically start at about $5,000, and can quickly climb to more than $20,000 with large structures (say a 20′-by-24′ rectangular vinyl) and add-ons. Gazebos–possibly the most recognizable of the outdoor room and shade solutions because of their presence in parks and public spaces–are a bit different from pergolas and pavilions in that they feature hand railings. These structures are more enclosed than pergolas and pavilions, and they are often octagonal, rectangular or round in shape. Gazebos may or may not be elevated, so stairs are an option. Construction materials may include wood, vinyl and stone, while the roof may be constructed anything from metal to plastic to asphalt shingles or cedar shake shingles. Decorative details range from rails to roof trim to windows and more. While gazebos made of cloth are less expensive, prices for those made of wood or vinyl start at a few thousand dollars for, say, a 6-foot, round gazebo, and can reach more than $30,000 for sizes in the 30-foot range. Another item to think about when designing an outdoor room is the retractable awning. These devices attach to the side of your home and the canopy–ideally made of a fabric, such as Sunbrella, that protects against UV rays–extends to create a shaded space, usually over a patio. The size of the covered area depends on the width and extension of the awning. Some popular widths are 10, 15-and-a-half, 19-and-a-half, or 25 feet, with projections varying: 8, 10, 25 feet and so on. When selecting an appropriate awning size, do remember that you will want to leave some room for sunbathing, so an awning that covers the entirety of your patio is not ideal. Another configuration to avoid: placing the BBQ grill beneath the awning. The embers could burn the fabric. One important consideration with an awning is care and maintenance, as awnings should always be retracted when you leave a space because of the threat wind and bad weather bring. If you foresee forgetting to manually roll in the awning, consider a product that features a remote control and an automatic wind sensor to prevent an accident. And don’t overlook one of the major upsides to the awning–that you can select a canopy to match your patio furniture or umbrella. Many of these structures may be bought as a kit, perfect for the DIY fanatic. And although installation costs could add to the overall price tag of any of these projects, hiring professionals could also save some time and perhaps a few headaches. For the handy homeowners who prefer to build from scratch, there are plenty of pergola plans, pavilion plans and gazebo plans available online. Some questions to keep in mind are what style would go well with your home’s exterior; whether the outdoor space would get more use if it was screened in; and how you will preserve your outdoor room structure over the years. This could mean staining or sealing a wooden pergola annually, scrubbing an awning fabric each season or using a mix of water and mild detergent to wipe down a vinyl pavilion fairly often. No matter which shade solution you are leaning toward, remember to take proper measurements (these structures should be big enough to make a statement in your backyard, but not overpower the area), make sure you have the proper landscape (most likely a flat installation area, at least for pergolas, pavilions and gazebos) and plan for the space by thinking about what you want to put beneath, in or around it. Will that table and its six chairs fit? What about your planters? The fire pit? The pool lounge chairs? Any shade structure will not only enhance the appearance of your home, but also keep your home cooler (up to 20-percent in the case of an awning). 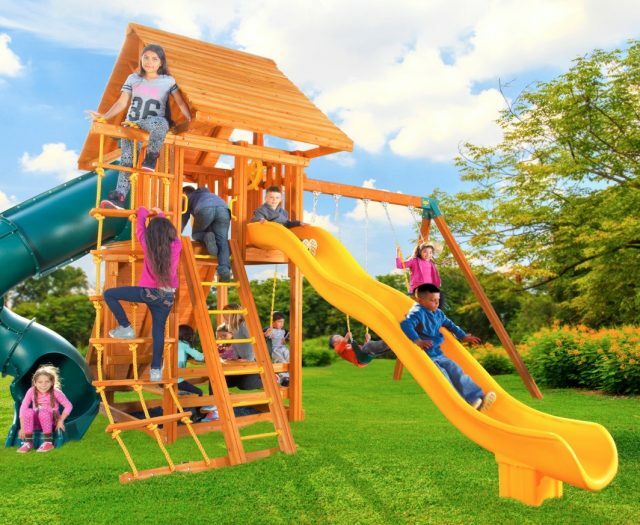 It will also extend your time outdoors and give you a destination in the yard. Instead of everyone always gathering inside the house in the kitchen, family and friends will flock to your outdoor living space, too. 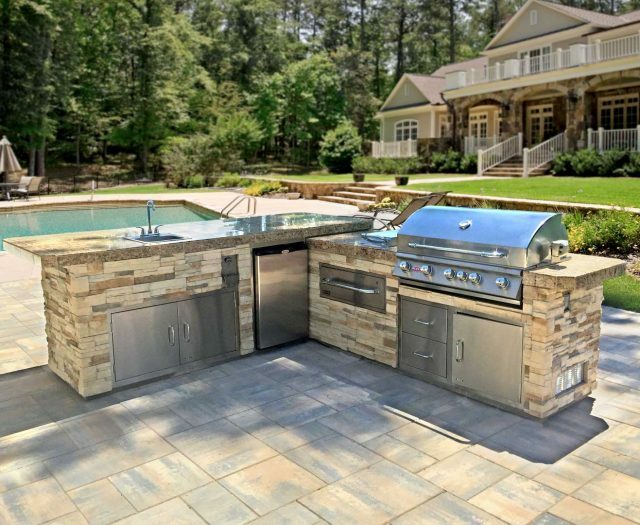 What sorts of questions are you facing in your creation of the perfect outdoor room? 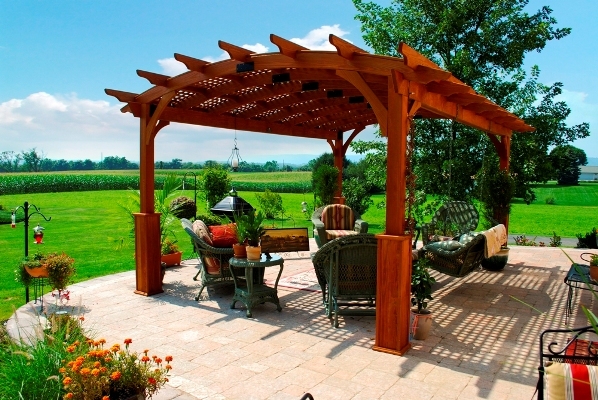 Homeowners who already own a pergola, pavilion, gazebo or awning, what advice would you offer? Contact us for help turning your ordinary backyard into the backyard of your dreams!